I'm very surprised of the amount of compliments and questions I've received about this subject and that's why I decided to dedicate a whole post about it. Me ha sorprendido la cantidad de halados y preguntas respecto a este tema, es por eso que decidí dedicarle toda una publicación a esto. Tattoos are still a taboo in certain places and families, I'm aware it's not something for everybody and everybody takes tattoos differently, if you don't like tattoos that's perfect and if you do, great as well. With this post I'm not trying to convince you or promoting getting tattoos, here's just my experience and answers to some of the questions I've received, thought I should give a little disclaimer just in case! I was not a tattoo fan at all, I know it may sound contradictory but I never liked the appearance of the whole sleeve and seeing all the skin inked, I found it dirty for some reason. 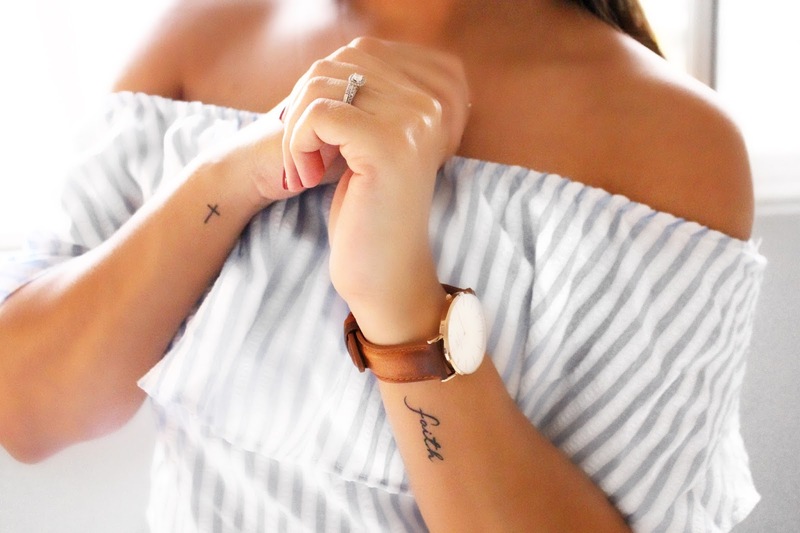 However I always liked the simple, subtle, small tattoos, actually for as long as I can remember I've been writing with black sharpie the word ''faith'' on my left wrist and with time it became something so personal that I wanted to keep permanently there. We set a date and we kept postponing it and postponing it, must confess I was a little scared you know it's not the same ''said than done'' so when I finally got the courage we went and as soon as I stepped into the tattoo shop I told my husband I was leaving haha, It's so funny now looking back, what fear can do to you guys! Establecimos una fecha y los posponíamos y posponíamos, debo confesar que esto se debió a que yo estaba asustada, ustedes saben que no es lo mismo ''llamarlo que verlo venir'' así que cuando finalmente reuní el coraje ''suficiente'' fuimos y desde que puse un pie en el local le dije a mi esposo que me iba a ir, haha, es tan cómico viéndolo desde esta perspectiva, es increíble lo que el miedo puede hacer con nosotros señores! I think is very self explanatory, it's just a reminder of what I believe in, where I stand in life. Faith has always been such a huge part of my life, I have a deep connection with the meaning of that word that I needed to have them on my skin. I'm a very visual person so I wanted to have them in places where I could see them all the time. Entiendo que es algo muy evidente, es solo un recordatorio de lo que creo, lo que soy, donde pertenezco. La fe siempre ha sido una parte muy importante de mi vida, tengo un conexión muy profunda con el significado de esta palabra de manera que necesitaba verla en mi piel plasmada de esta forma. Soy una persona muy visual así que quería tenerlos en lugares donde los pudiera ver todo el tiempo. How was the pain? Did you cry? Como fue el dolor? Lloraste? This question is so funny to me because what kept me from getting a tattoo all this time was pain, nothing more, nothing less, the pain! and guys it wasn't painful at all, I was prepared to handle pain like a badass but it just didn't happen, I think the best way to describe how it felt is like having a cat scratching your skin over and over, it stings a little bit, it's an uncomfortable feeling of course, it could go over some areas where it may hurt a little but nothing unbearable that's for sure. Remember everyone handles pain in a different way that was just my experience, my husband didn't have a good time and our tattoos were in similar areas. So, no! I didn't cry and if I knew that was how it was going to feel, I would have done it years ago. Esta pregunta me causa tanta gracia porque esta fue la razón por la cuál no me había tatuado anteriormente, el dolor, nada más y nada menos que el dolor! y la respuesta es no, no fue para nada doloroso, yo estaba preparada para recibir el dolor como la más ruda de todas pero sencillamente no sucedió haha, creo que la mejor manera de describir como se siente es el tener a un gato arañándote la piel una y otra vez, es una sensación punzante, es incomodo por supuesto, en ciertas areas si puedes sentir molestias y un poco de dolor pero nada intolerable. Recuerda que todos toleramos el dolor de manera distinta, mi esposo no la pasó nada bien cuando lo estaban tatuando y nuestros tatuajes fueron hechos en areas muy cercanas. Así que no, no lloré y de saber que eso era lo que iba a sentir me hubiese tatuado hace muchos años. What my parents said about them? In that aspect my parents can be very traditional, my dad specifically doesn't like them, but to my surprise they took it pretty well, (specially because I don't live in their house anymore, haha!) they both said they look pretty and subtle plus they understood the meaning behind them which is what really matters to me. En ese aspecto mis padres pueden ser muy tradicionales, a mi papá específicamente no le gustan, pero a mi sorpresa lo tomaron muy bien, (especialmente porque no vivo con ellos, haha!) a los dos les pareció que lucían bonitos y sutiles además entendieron el significado detrás de ellos lo que para mi es más importante. It depends of many things: the size of the tattoo, how complex your tattoo is going to be, how much coloring and shading it would have, the tattoo shop and other factors can affect how much your tattoo will cost. Since I had two tattoos done at the same appointment I paid 3,000 Dominican pesos which is 65 dollars, I got that price because they used the same needle and materials for both of my tattoos. If I only got one done at that moment the price of ''faith'' would have been 2,500 Dominican pesos which is 54 dollars. Depende de muchas cosas: el tamaño del tatuaje, que tan complejo tu tatuaje será, que tanto color o sombra se llevará, el lugar a donde vayas y otros factores afectaran el precio de tu tatuaje. Como me hice dos tatuajes el mismo día pagué 3,000 pesos Dominicanos que son unos 65 dólares, obtuve ese precio porque usaron los mismos materiales y la misma aguja para mis dos tatuajes. De haberme tatuado solamente uno en esa ocasión el precio de la palabra ''faith'' hubiese sido de 2,500 pesos Dominicanos que son 54 dólares. How you take care of it? Como es el cuidado del tatuaje? This I found a little stressing. You have to wash it with an special soap for the first 2 weeks, you have to moisturize it with a special lotion, you can't expose it to the sun for the first 2-3 weeks, you shouldn't put it under water for the first 2 weeks because the scarring can get softer and fall off before the proper time so your tattoo would be ruined. You shouldn't be touching it since it's an open wound and yes, it can get infected, believe me, you don't want that, google tattoo infections if you want to make sure! It can get a little tedious the first couple of days but you get used to it. Esto si lo encontré un poco estresante. Tienes que lavarlo con un jabón especial por las primeras 2 semanas, tienes que mantenerlo hidratado y hacerlo con una hidratante especial, no puedes exponerlo al sol por las primeras 2-3 semanas, no deber sumergirlo bajo agua por las primeras 2 semanas porque las costras de la cicatrización pueden ablandarse y caerse antes de tiempo haciendo que parte importante de la tinta de tu tatuaje se caiga. No debes tocarlo ya que es una herida abierta y si, puede infectarse, creanme, no quieren que eso pase, busquen en google infecciones de tatuajes si quieren asegurarse de lo que digo! Puede tornarse un poco tedioso los primeros días pero se acostumbrarán. What would you say to those who are wanting to get one? Que le dirías aquellas personas que quisieran hacerse uno? Be responsible, it's something you're willing to keep forever, be sure of what you want to get, take it personal and not for trend or because it looks cool. Do some research, a very deep one, don't go to the first place that comes to your mind. Make sure your tattoo shop is clean and goes with the right procedures. Once again, remember pain is relative and people tolerate pain differently. I'm so glad I had mine done since I feel I accomplished something I never thought I would have done. Se responsable, es algo que durará toda la vida, piensa bien que es lo que quieres, asúmelo como algo personal y no por moda o porque sencillamente se ve cool tener uno. Investiga, infórmate bien, no vayas al primer sitio que te pase por la mente. Asegúrate de que donde te tatuarás sea un lugar limpio y que sigan los pasos correctos. Una vez más, recuerda que el dolor es relativo, las personas toleran el dolor de manera distinta. Estoy muy agradecida de que me haya decido a hacerlo ya que siento que logré algo que pensé nunca haría. Tell me what do you guys think? Do you have any? How was your experience? Thank you so much Catia, now I want to see yours! Que bonitos y finos son. 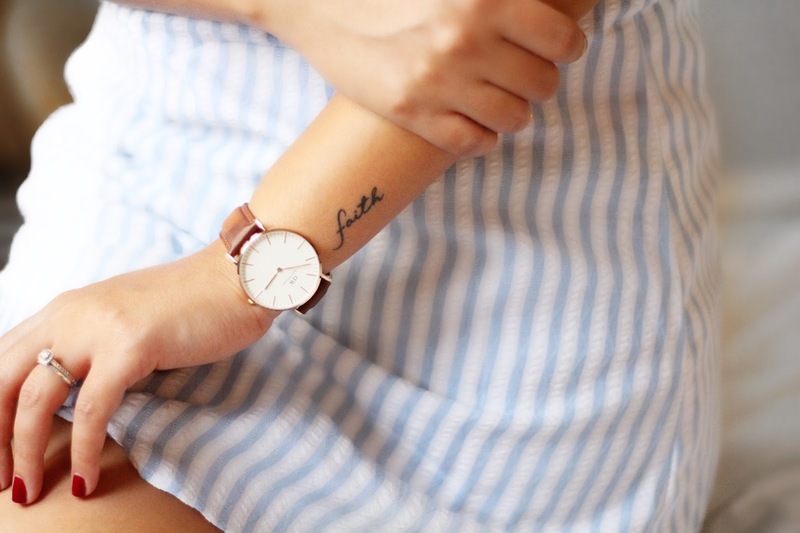 A mi me encantan los tatuajes. Un beso guapa. Gracias Jenn!! Otro para ti!! Thank you so, so,so much Yaqueysi, always a sweetheart!!! Happy you understood my point, thank you for passing by and taking the time to leave me such a lovely comment, tons of love for you! So personal and interesting post dear! Such a emotional and perosnal post babe!! Love your tattos and the history behind them. Well, I think that tattoos would be really special. I would like to get one more on me.